This is another very simple tutorial I bring to you! 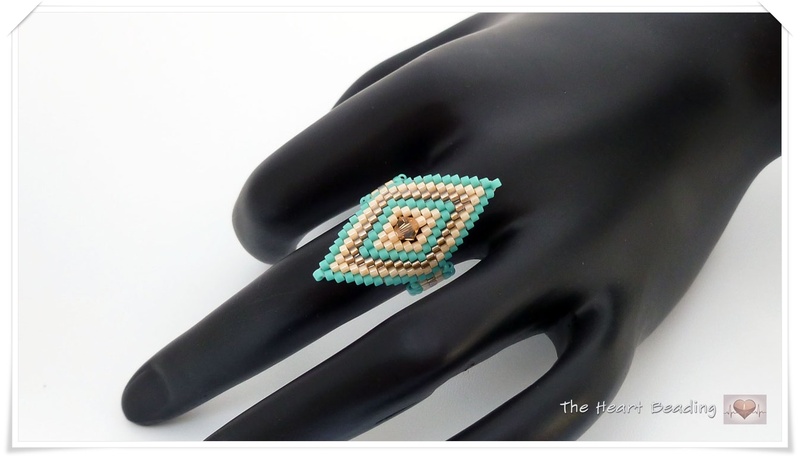 To make the ring I used brick stitch in the central part (to create the rhombus) and odd count peyote stitch and picot to create the ring band. In the video I show you all the steps necessary to create it. I hope you enjoy it! Watch the tutorial for the ring HERE and the tutorial for the earring HERE. Another version of the brick stitch earring! 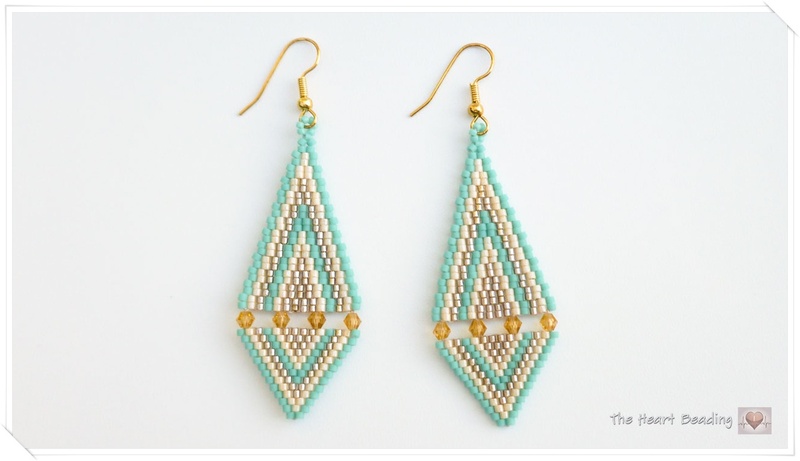 You can watch the tutorial for this earring HERE. 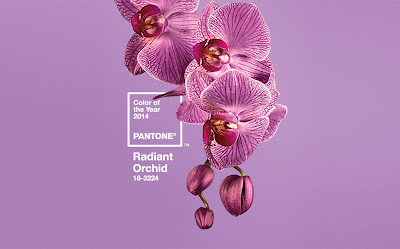 Pantone anounced the color of the year for 2014: Radiant Orchid. The color, according to Pantone, it's a member of purple family although has a lot of pink in it. 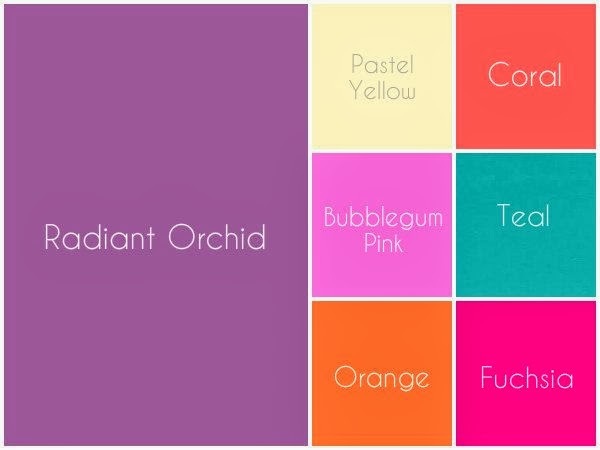 The Radiant Orchid will replace the emerald green, the color of the year 2013. 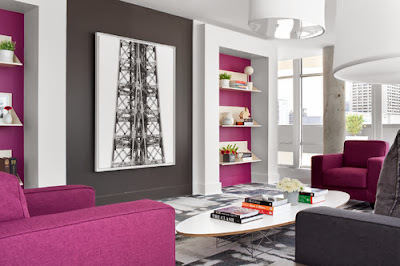 For being such a vibrant color, Radiant Orchid combines very well with neutral colors like gray (an "it" color for the winter 2013) and beige. Here are some examples to show you how to mix this vibrant tone with neutral colors like gray, beige and white. 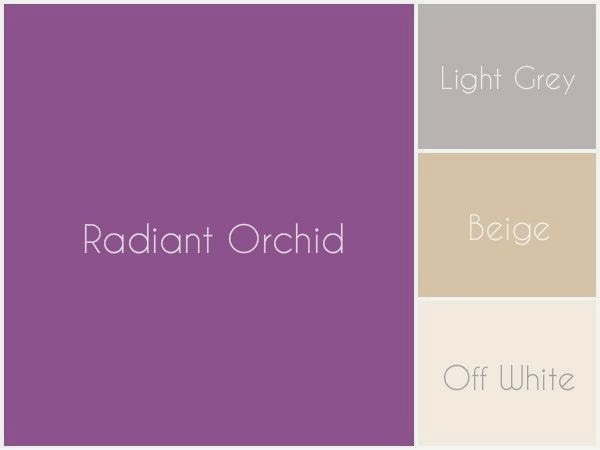 But the Radiant Orchid also combines with other vibrant colors. I've seen beautiful mixes of this color with green, turquoise, yellow, orange, dark blue and some shades of pink. In my opinion, this new color should be used with moderation because there's a lot of people who doesn't like pink colors! As you can see in the previous pictures, the Radiant Orchid is normally use in details, moderately. And that's the big deal for everyone who makes beading jewelry. 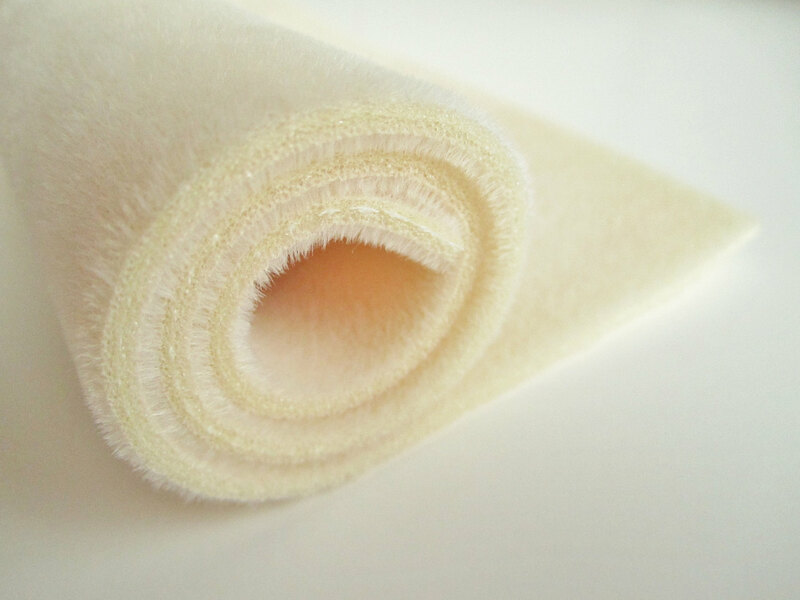 People will want this color mainly in nails, makeups and accessories like purses, shoes and jewelry. I can't wait to see the seed beads in this new color. And see what all of you can come up with it! 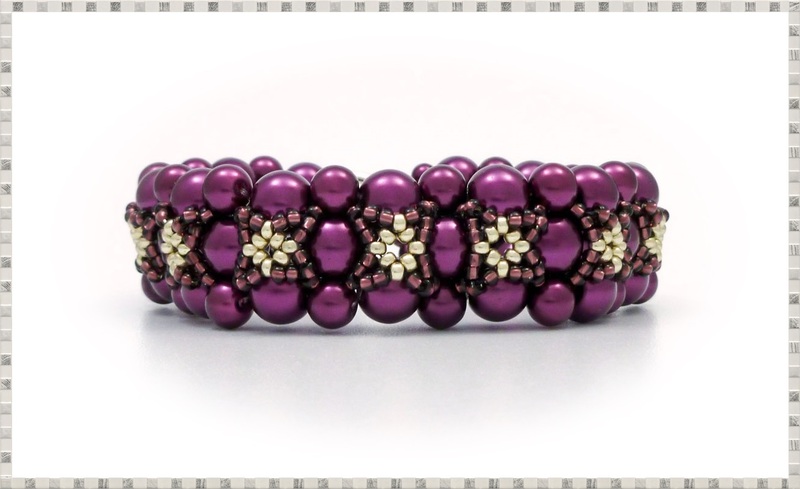 This bracelet is another design of Svetlana McDaniel. 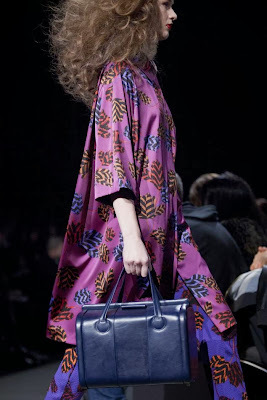 I became a big fan of her patterns because they're very simple and easy to follow, and the result is stunning! I got a lot of compliments for all the pieces I made from her designs! 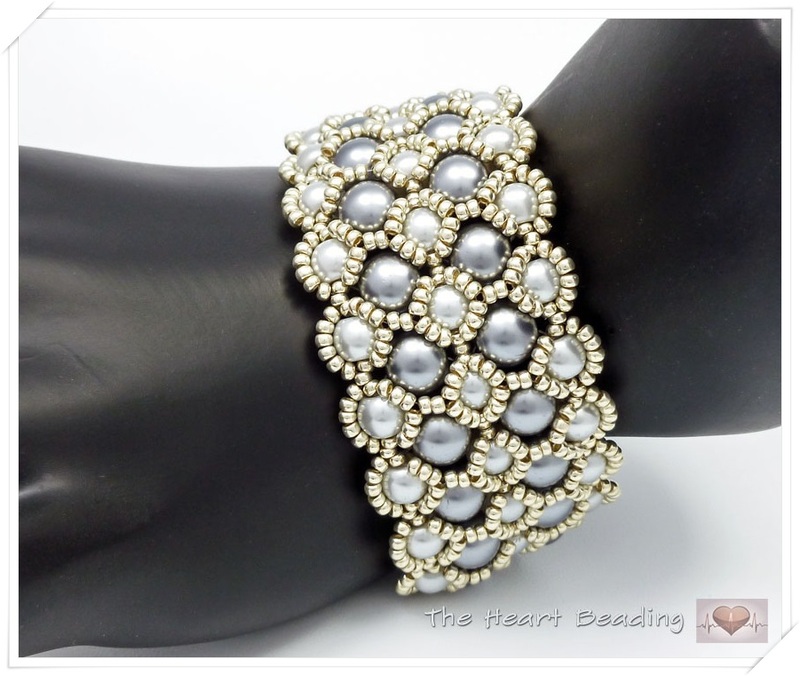 You can watch the tutorial for this bracelet here. For this pattern I did some modifications at the end because the edges of my bracelet were loose and not aligned. I took a picture to show you the problem. As you can see in the photo above, the edges of the up side are misaligned (indicated by the red arrows). 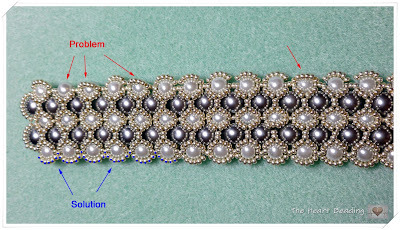 To solve this problem, after completed the bracelet I added a new thread and passed through all the beads from the edges, including the middle bead from the set of three seed beads between the pearls. I marked the path with blue dots to show you it better. To finish I added a two-strand clasp to bracelet instead of a toggle clasp as in the original pattern. 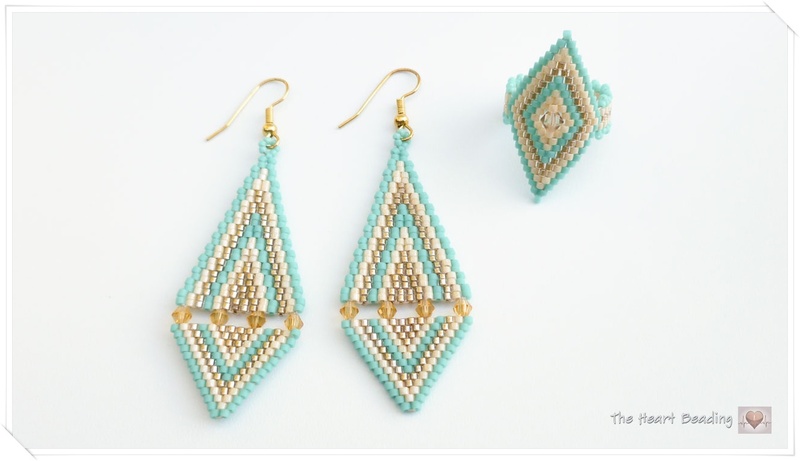 I made this earring to show you how to do brick stitch. The design is very simple and the tutorial is specially for those who never tried this stitch before. Basically you'll create two triangles by making decreases in brick stitch. To make the big triangle you'll work in two-drop brick stitch, which means that each row of the triangle has two beads tall. At the end we'll join the triangles by attaching the crystal bicones between them. And to do this we'll also use the brick stitch. I suggest you to use a thin needle to make this project because it will make your work easier. Sometimes it's hard to pass underneath the thread to do the brick stitch because it's too tight, so a thinner needle will helps a lot. 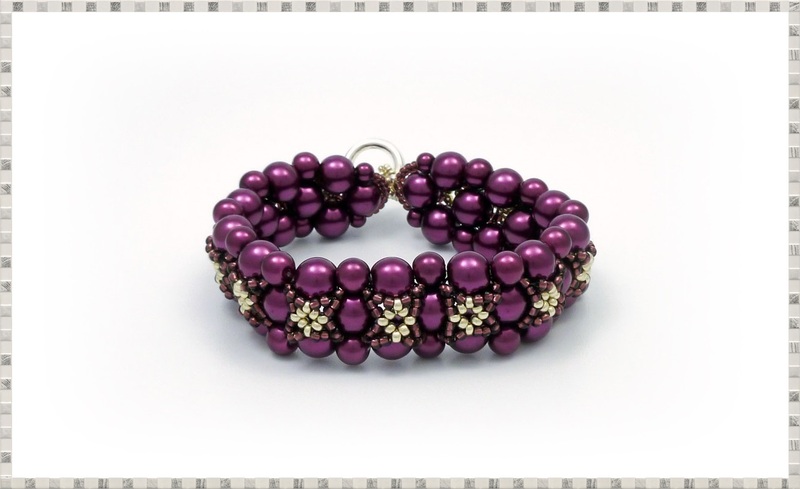 Today I bring to you a very easy bracelet in brick stitch. 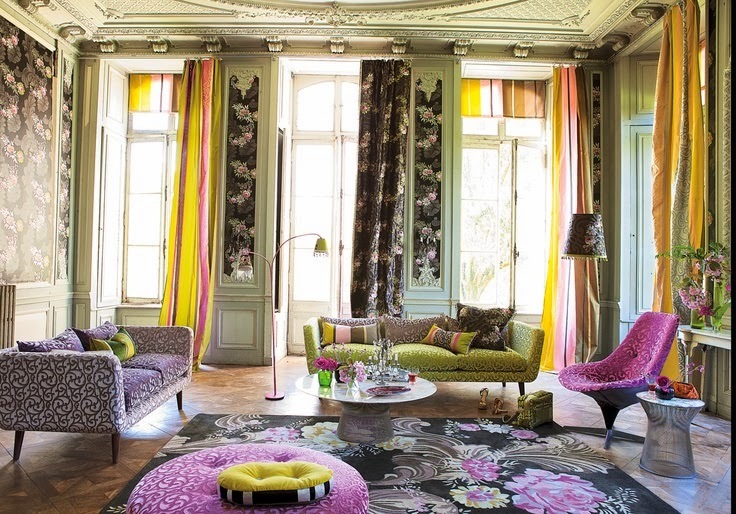 It was designed by Margherita Fusco. 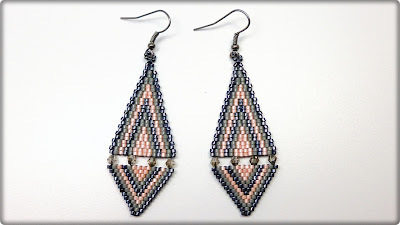 In the video tutorial she shows how to make the rhombus using only decreases. It's a clever idea to start the rhombus in the middle, so you just need to make decreases in both sides to complete it. 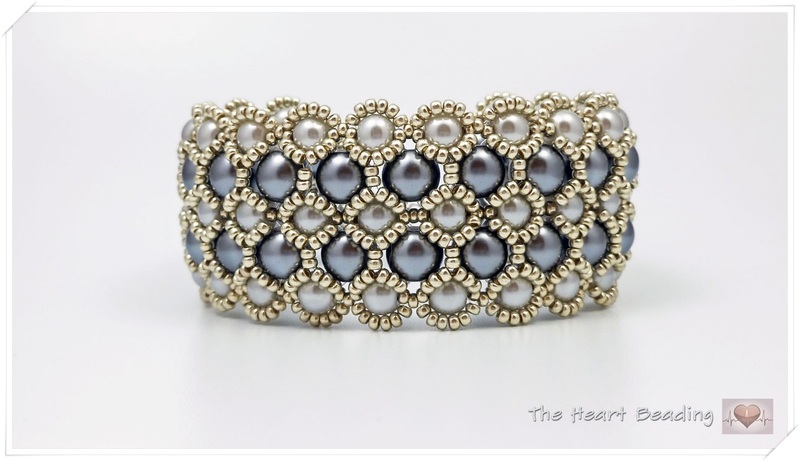 I made this bracelet because I love it when I saw the video tutorial at YouTube. It's designed by Svetlana McDaniel. The video is in Russian but it also has English caption. You can watch the tutorial here. The pattern is very simple and easy to follow, what is great for beginners. 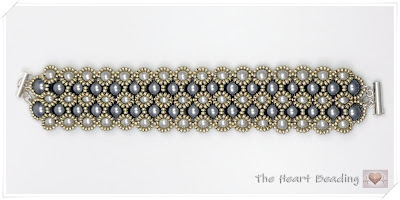 My version of this bracelet isn't flat and nice as it was supposed to be. There's no enough room to the 6mm pearls sit between the 8mm pearls. I'm not sure why this happened. 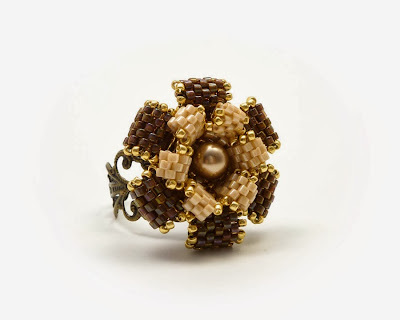 It may be because I used a very thick thread (illusion cord 0.25mm) to make the base with pearls. I didn't have wire guardians in silver color, so I used seed beads 15/0 (miyuki duracoat galvanized silver) to create a loop where I attached the clasp. This lovely ring is a design by Peetje from the French blog "Le Blog de Peetje". The tutorial is free and you can find it here. It's not a beginner project. To make it you need to know how to do the circular peyote and flat odd count peyote stitch. 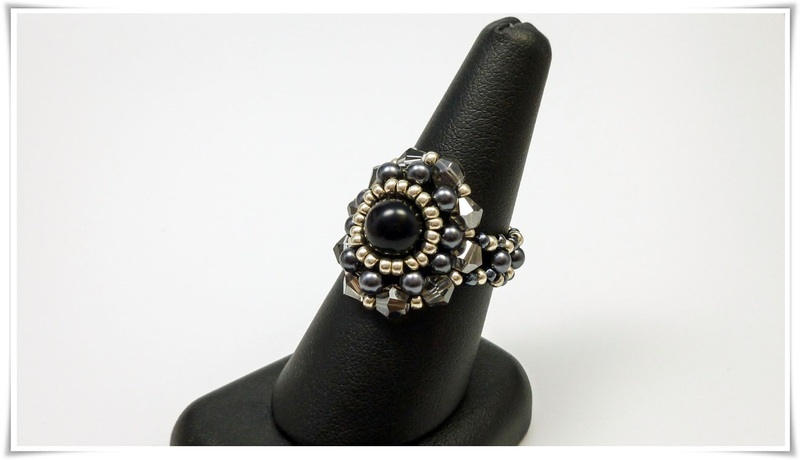 How I made the ring: first I made both flowers separately. Then I joined them with a thread, just passing through the beads in the base of both flowers. And finally I used the same thread to attach the pearl in the flower's center. To attach the flower to the ring base, I used E-6000 glue. 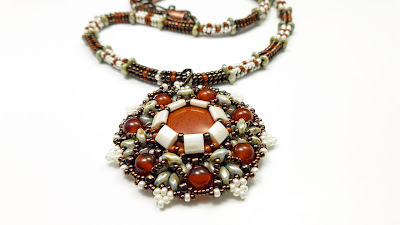 This video by Beaducation is an amazing introduction class of beadweaving. The teacher is Laura McCabe, a talented and famous beadweaver artist. 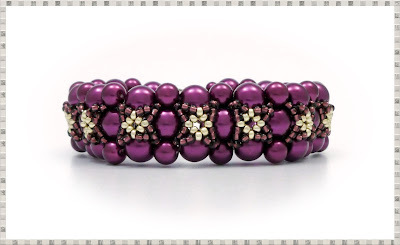 Besides covering all basic issues we already talked here in the blog (such as: basic tools and materials, types of seed beads, etc), the teacher give us many useful tips. And she also shows how to make even and odd count peyote stitch (flat and tubular peyote). Because so many people liked my last work, the Myrna Necklace, I decided to make a tutorial showing you how to do the tubular herringbone stitch. The project is very simple. 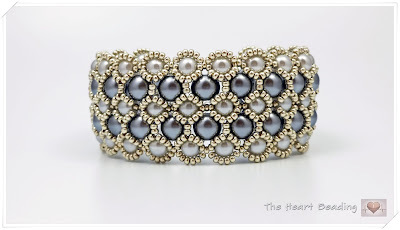 It's a bangle totally made in herringbone with increases and decreases to create a ripple effect. I think it's a good project for beginners! Bangles don't have clasps. So we need create them longer than an usual bracelet. 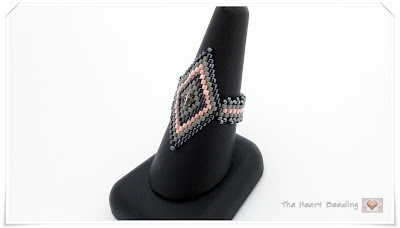 This post from Beading Daily shows how to measure correctly you hand to create a bangle. 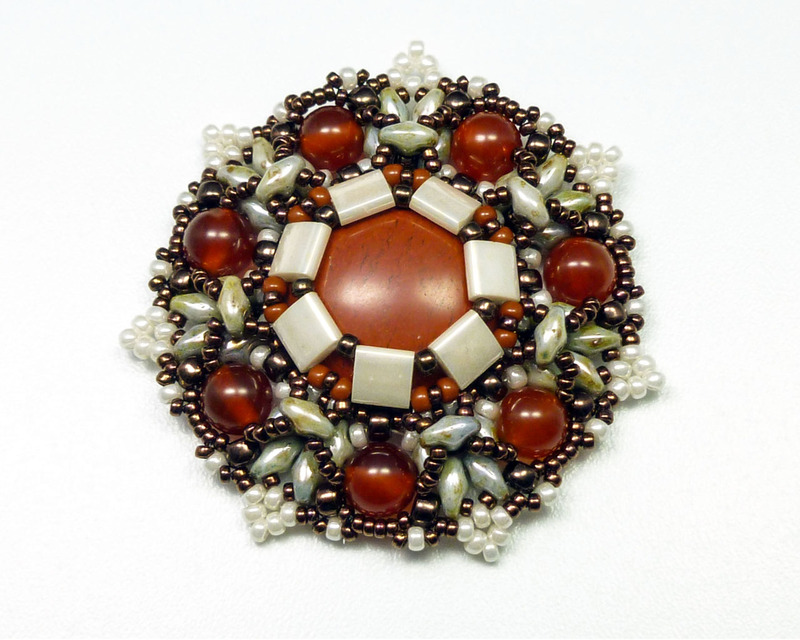 Beads are the most basic material used in the beadwork. They can be made of any type of material (glass, wood, paper, fabric, plastic, etc.) and can have any shape or size. 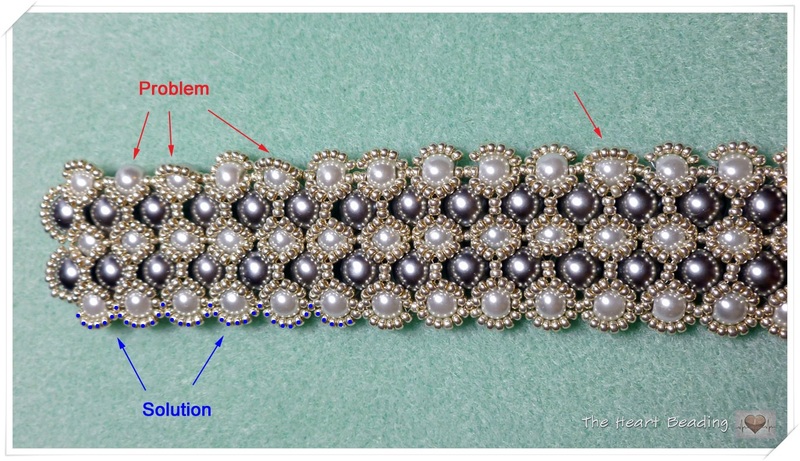 But what all the beads have in common is the hole (usually in the center) for threading or stringing. 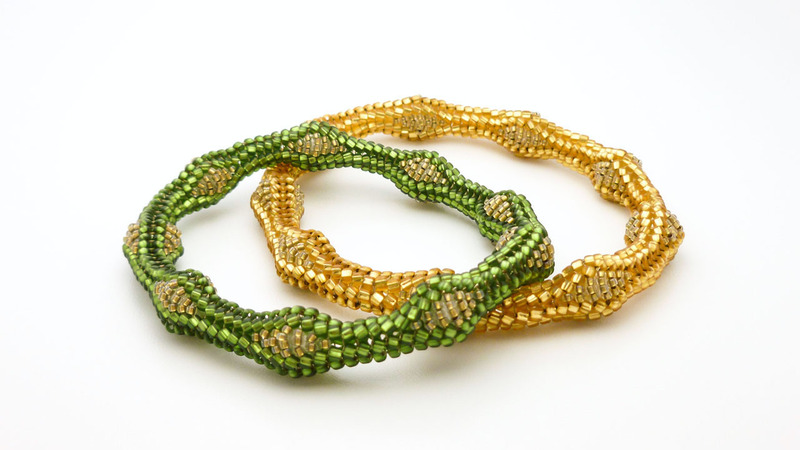 The seed beads are made of glass. The traditional seed beads have a rounded shape and the size is identified by a number. The most common sizes are: 15/0, 13/0, 11/0, 10/0, 8/0, and 6/0. The higher the number the smaller the size of the seed bead. Thus the seed beads size 15/0 are the smallest, while the seed beads size 6/0 are the biggest. 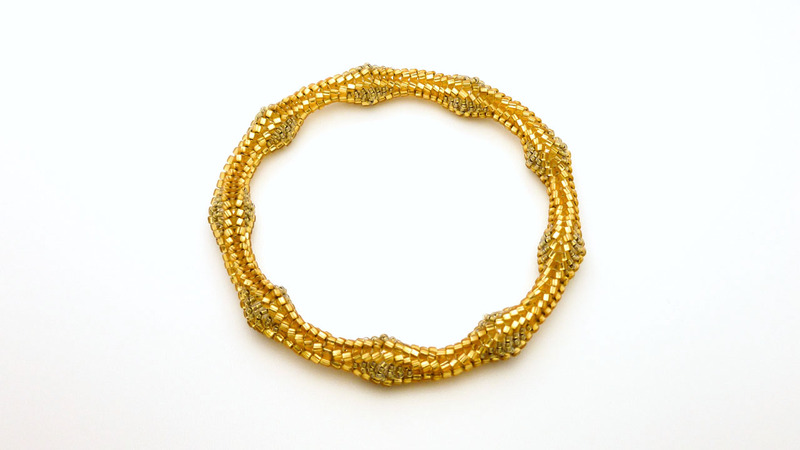 There are also seed beads in other shapes besides the traditional one. 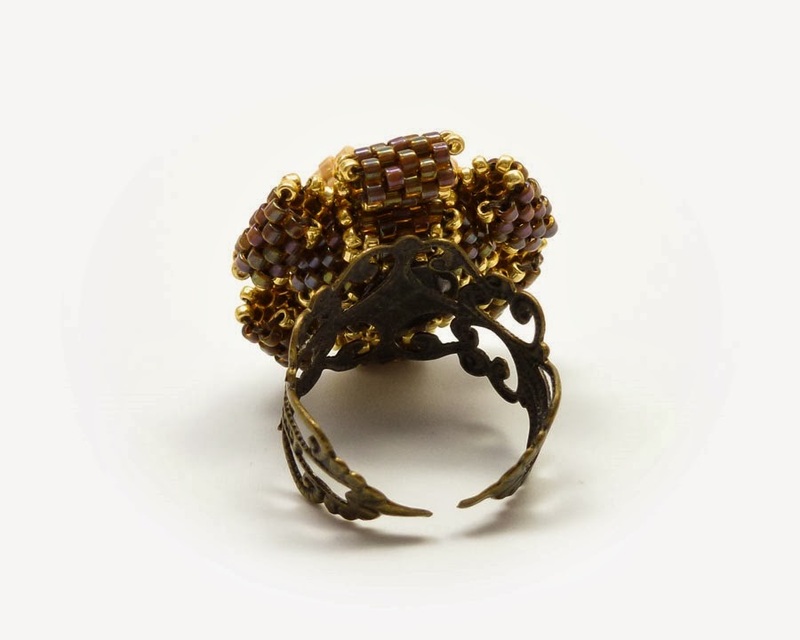 The most common shapes are: cylinder beads, triangle beads, bugle beads, cube beads, and hexagon beads. 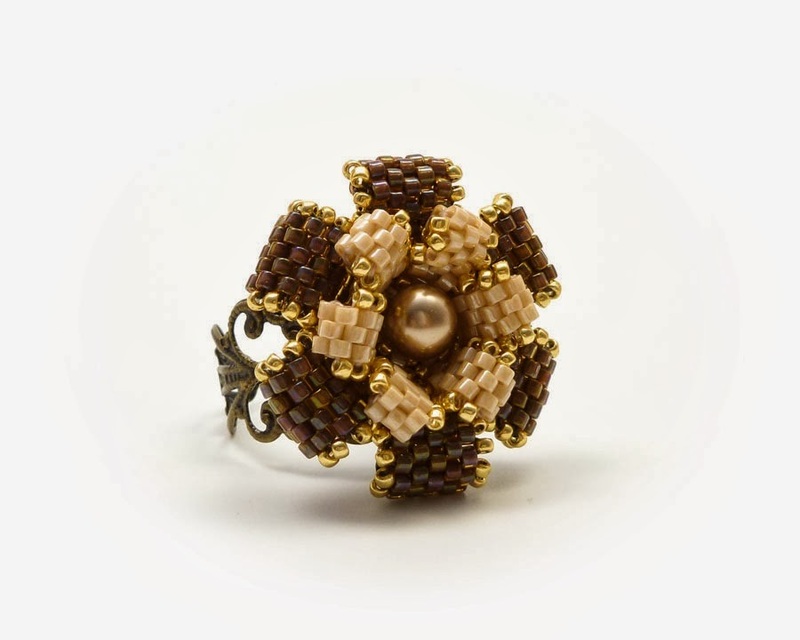 The size of the cylinder, triangle, cube and hexagon beads is identified by a number, just like the traditional round seed beads. The size of beads in other shapes is indicated in millimeters. 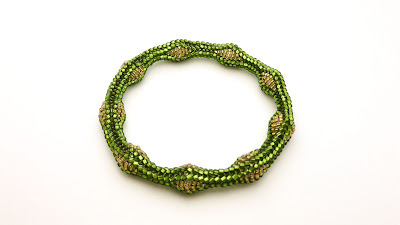 Currently, the seed beads are produced worldwide. 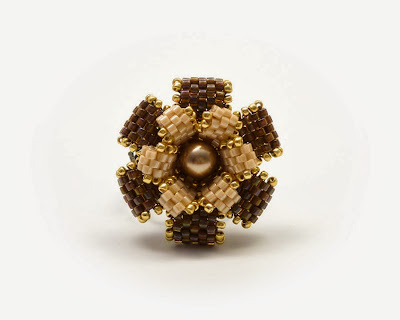 The most famous are: the Japanese seed beads (from the brands Miyuki, Toho, and Matsuno) and the Czech beads. The Japanese beads have better consistency in color, size, and shape. And because of that they are also the most expensive. 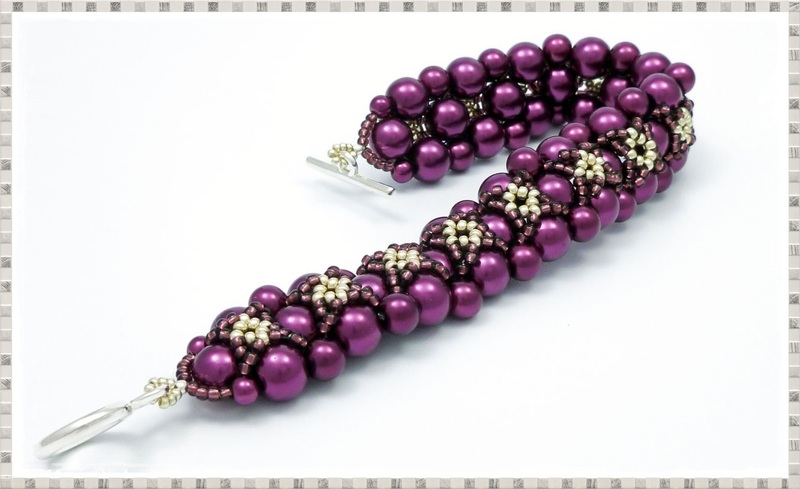 The cheap seed beads, like the Chinese beads, are very irregular in size and shape. And it's important to know that seed beads from different brands may vary in size and shape. 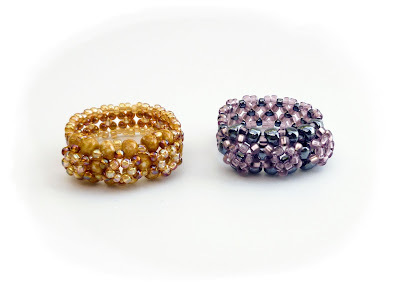 To finish our topic about seed beads, I brought some videos that explain more detail the various types, sizes, and colors of seed beads. That's my last creation! The pendant is designed by Ewa. You can find the tutorial here. It's not a beginner project, but I think it's pretty simple to make. If you have some experience in beadwork, you should try this pattern! 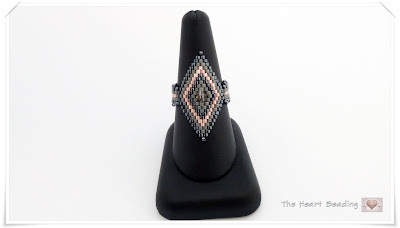 You will learn a different method to bezel a cabochon, using tila beads. I had a lot of fun making this pendant! My real challenge was creating a necklace for the pendant. I tried some chains and cords, but I wasn't happy with the result. 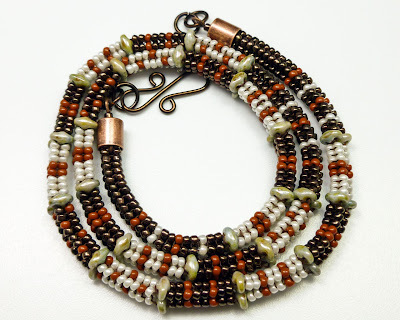 So I decided to create a necklace with beads. After tried several designs, I ended up with a herringbone rope. 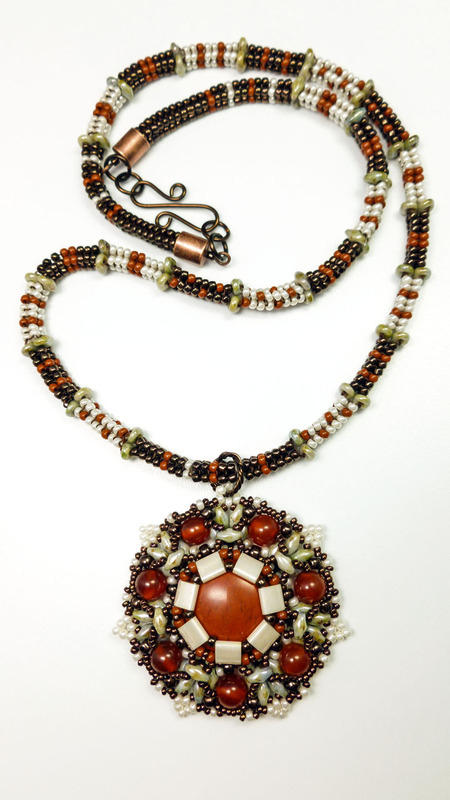 I used the same colors of the beads used to make the pendant. To finish, I attached a bead cap to each end of the necklace using an eyepin (if you want, I can make a tutorial showing how to attach a bead cap with eyepin to the herringbone rope). And finally I added a clasp, that I made with Parawire in smoke color. 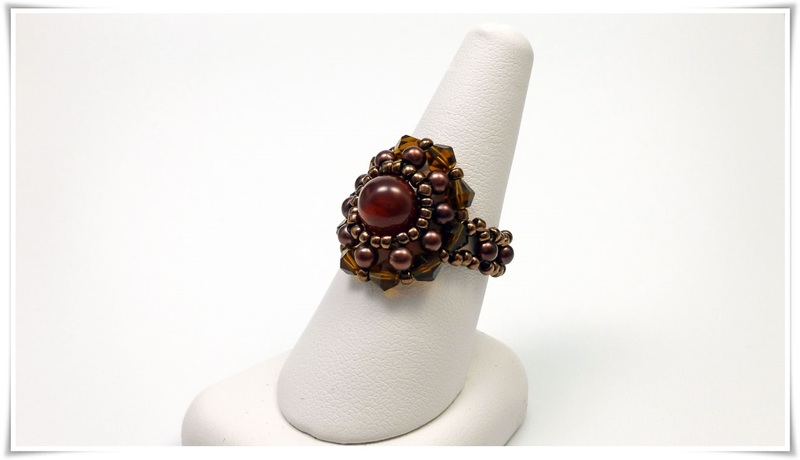 This is another ring for beginners. Although it's very easy to do, I'm not sure if it's so easy to explain. I'm editing the video tutorial and I hope it will be clear and easy to you understand. - 18 round bead 3mm; * The quantity of the last item will vary according to the size of your finger. For this weekend I want suggest two super easy and fast tutorials. 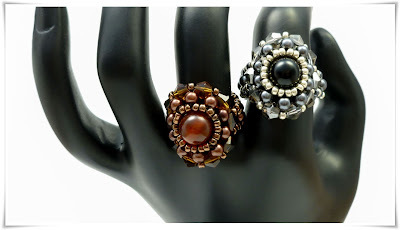 They are: the Trinity Beaded Ring, designed by Aleshia from Beadifulnights channel; and the Earrings with Swarovski Bicones designed by Svetlana McDaniel. The ring is very pretty. What I most liked in it was the ring band. It's stiff what gives more stability to the ring. I love that so much! I'll definitely use this ring band to other rings designs! Now the earring, what I most liked was its size and shinny. It looks very gorgeous when you use it. 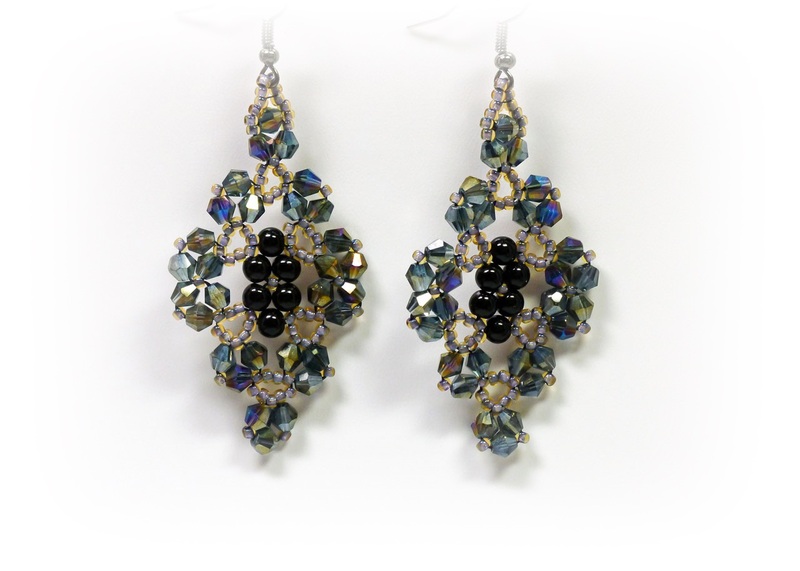 In my version I used cheap bicone crystals because I did not have the required amount of Swarovski bicones to make it. But it still looks very beautiful. The video tutorial for the earring is in Russian, but it has text with the instructions in English. 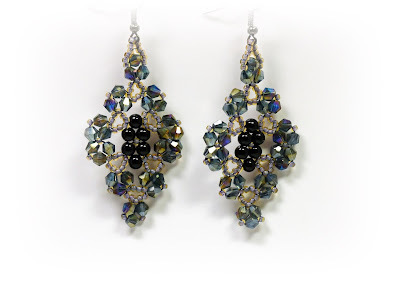 This earring was published in Beadwork Magazine Aug/Sep 2013. 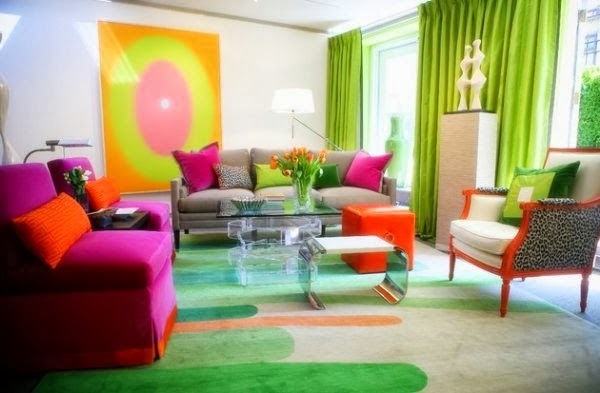 It's designed by Michelle McEnroe. 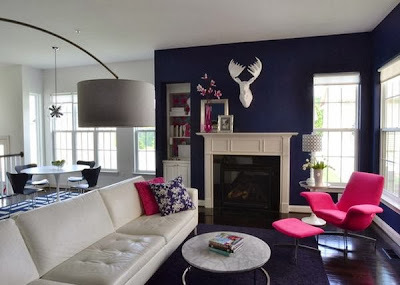 My biggest challenge in this project was the choice of colors. 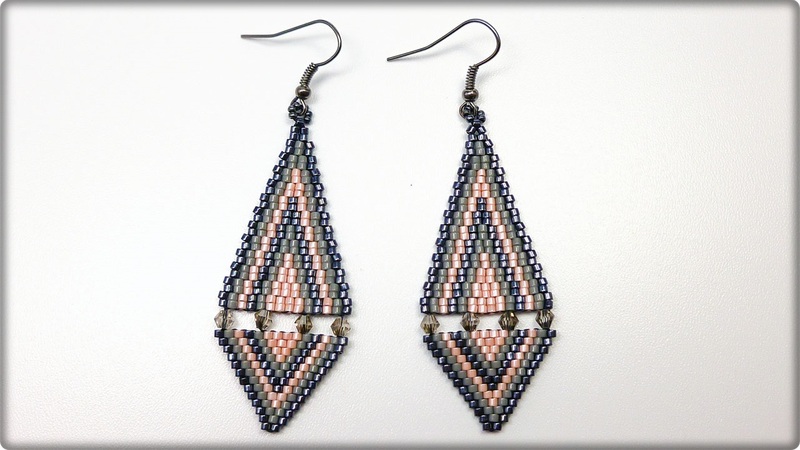 I had to use beads in seven different colors to make the earring. It's the first time that I use more than four colors in a single project! I found two good videos that talk about the basic materials for beadwork. They show some materials that weren't related in our previous post. If you have any question about those materials, send me an email or leave a comment. 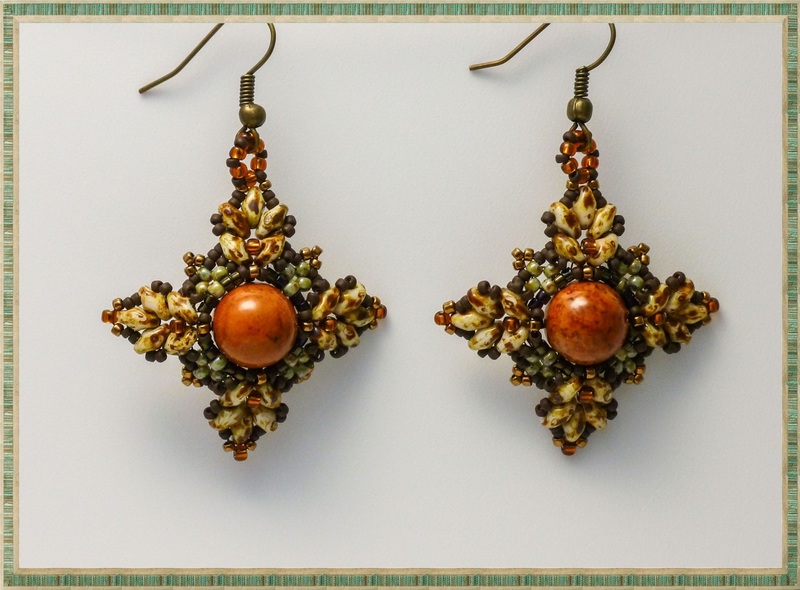 There are a lot of tools and materials used to create beadwork jewelry. 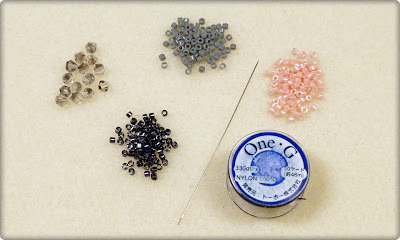 Beyond threads, needles, and beads, each technique you choose will require specific tools. 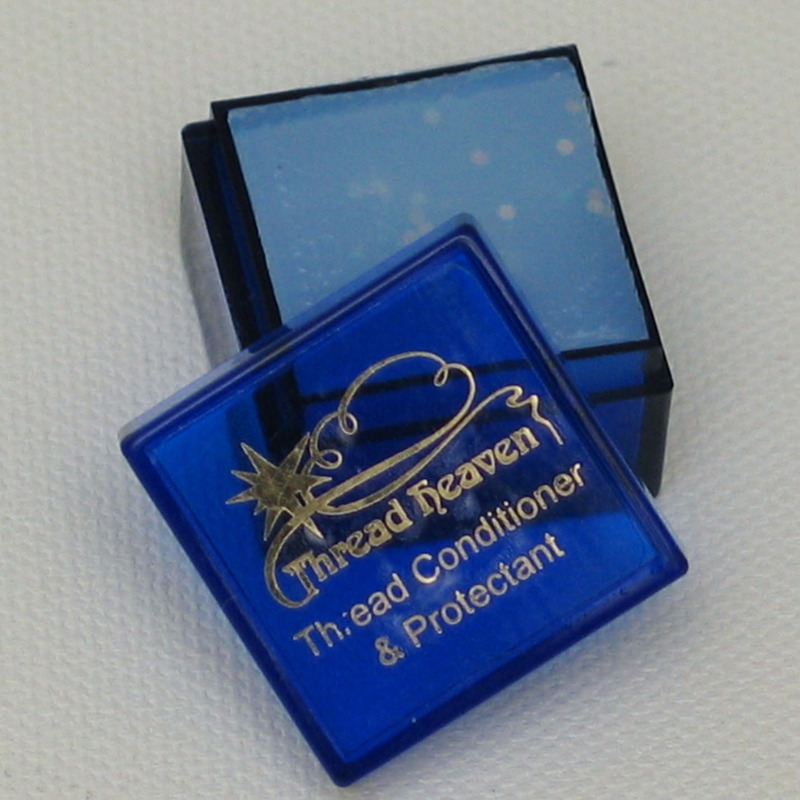 I will talk about the tools that I consider essential to you start beading. 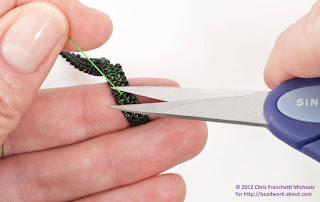 Scissors: you need sharp scissors with fine points to cut the thread as close as possible of your beadwork piece. 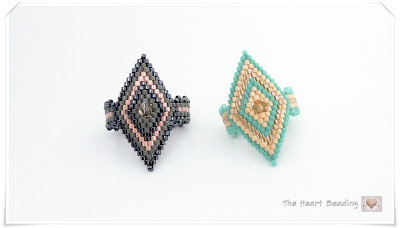 You don't want your finished jewelry with thread tips showing. 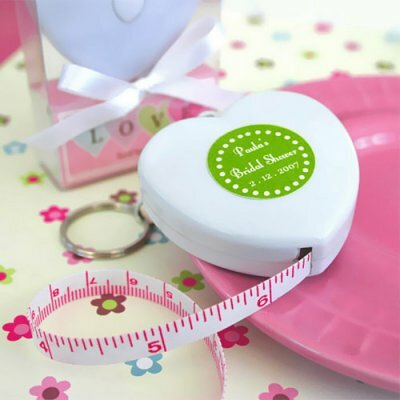 Ruler or measuring tape: you will need it to measure the thread's length before you start working, or even to measure your beadwork piece. 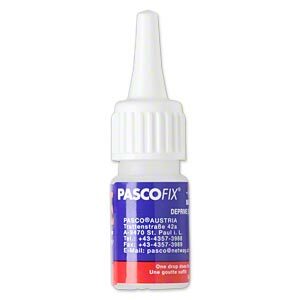 Glue: glues and adhesives are necessary when working specially with techniques like embroidery and soutache, for example. 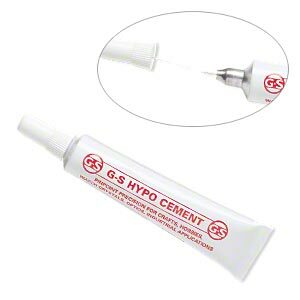 Sometimes you also need put a little bit of glue on the knots to keep them fall apart. 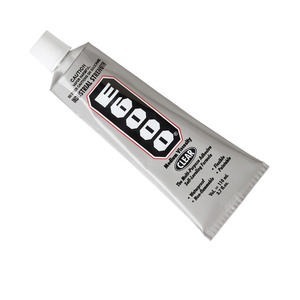 Some of the popular adhesives used for jewelry: E-6000, Epoxy 220, GS Hypo Fabric Cement, Jewel Bond and PascoFix Instant. 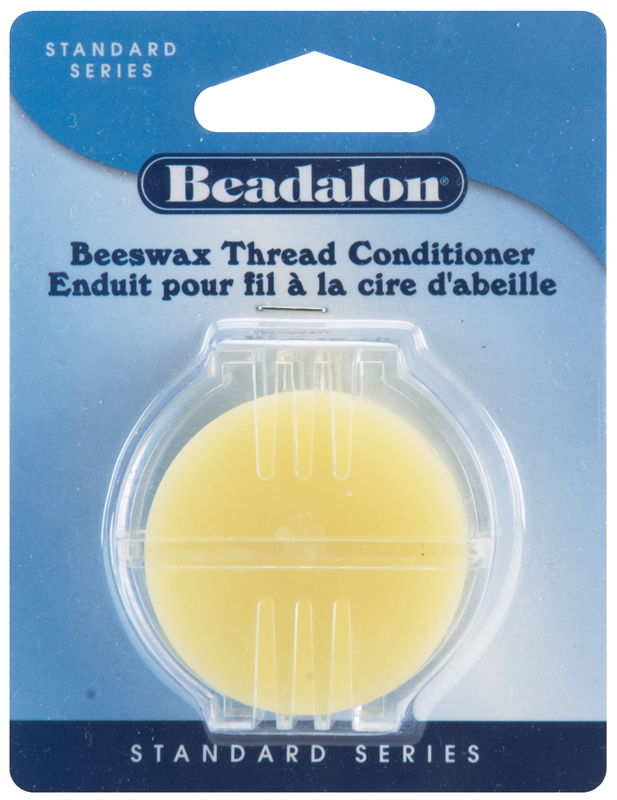 Waxes and thread conditioners: it's a substance used to coat thread to make it slightly stronger and smoother, and also make the thread less likely to knot or fray during use. 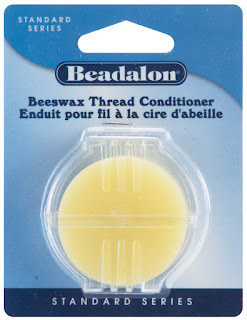 There are two types of conditioners: natural (beeswax) and synthetic (Microcrystaline Wax and Thread Heaven). Beading mat: A beading mat is a piece of fabric very soft and thick, with a velvety feel. It's great to work on it because the bead mat prevents your beads from rolling off your table. It has low cost and come in a good range of sizes and colors. 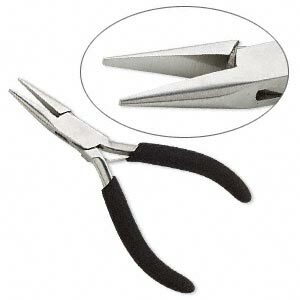 Chain nose pliers: they are rounded on the outside but have flat inside edges. They are good for gripping wire or a jump ring , and for closing metal bead tips. 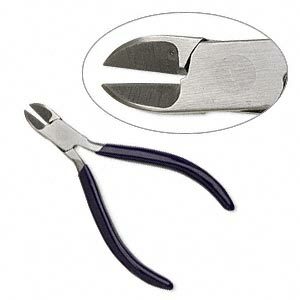 Flat nose pliers: they are great to make sharp bends and right angles in wire. And as the chain nose pliers, they're can also grip flat objects. Bent nose pliers: they're great to grip jumprings because with this plier you can reach angles and loops that you would have difficulty getting to with a straight plier. 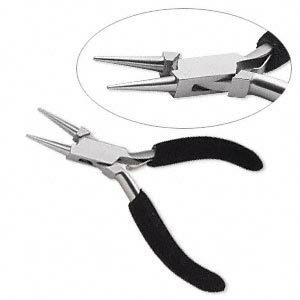 Round nose pliers: the plier's jaws are cone shaped form. They're used for create loops and curves in pieces of wire. 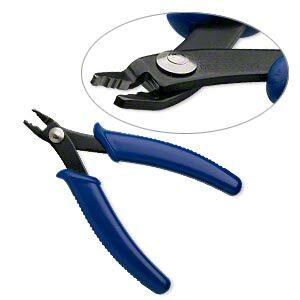 Crimping pliers: specialized pliers for squishing crimp beads. 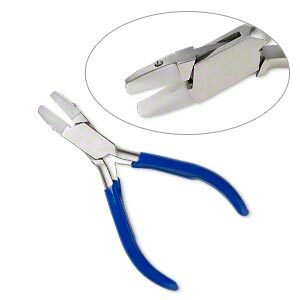 Nylon jaw pliers: these pliers has nylon jaws that let you work with the wire without leave marks on it. 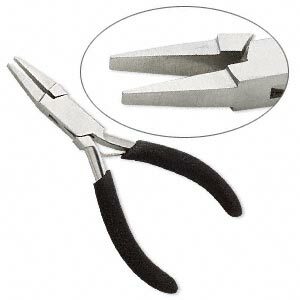 You can use this plier to shaping or straightening the wire. As an alternative to the nylon jaw pliers, there are products like the Tool Magic. 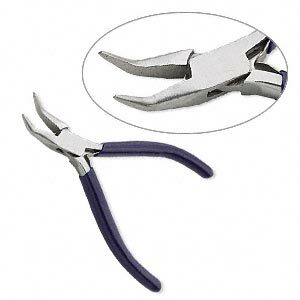 The product coats the jaws of your normal plier so you can work with wire without scratch its surface. But these products are temporary and after some use the coat wears off. Cutters: they're used to cut wires. The normal cutters have a sharp cut. To get a flat and clean cut you need a special kind of cutters: the flush cutter. 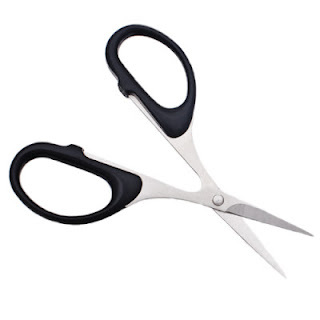 When you cut a wire with this type of cutter, you have one side of the cut flat and the other side sharp. This is the most indicated type of cutter to jewelry making. To cut memory wire you'll need a stronger type of cutters: the heavy duty cutters.